Well, the first part of the project is now finished. It took three days to complete, although I only cleaned up the edges on Thursday and touched up a few bits. I used Acrylic paint and matt medium to paint on the walls, having first roughly mapped out the drawing in pencil. 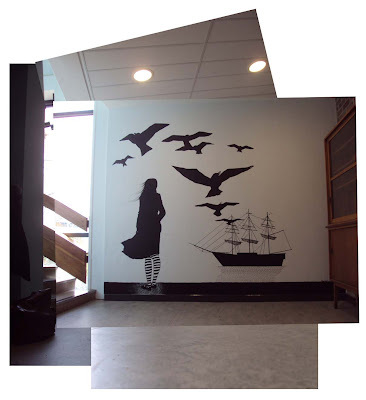 This was quite a change from the way I did my drawings for the MA show as I drew directly on to the walls in that case, but I was aware of the need to get it right for the school and also the time frame meant that I had to plan it out. I am really pleased with the outcome and hope that the girls like it too. I am always amazed by you . You seem nervous before projects but never have any hickups and always paint up a storm of excellence . That is such a lovely thing to say. Thank you! heres to the next one!